In December of 2015, Disney released the first live-action “Star Wars” feature in over a decade, and it became an instant smash, rekindling a dormant film franchise and racking up beaucoup bucks at the box office. There was only one problem– this new Star Wars movie felt just a bit too much like the first Star Wars movie. “Episode VII: The Force Awakens” followed the plot of “Episode IV: A New Hope” almost down to the beat, and while audiences worldwide certainly enjoyed it otherwise, the perceived over-reliance on story repetition undoubtedly left room for improvement. This week, the follow-up entry in the series, “Star Wars: The Last Jedi” (Episode VIII, for those keeping track) blasts its way into theaters, and I’m happy to report it never suffers from a problem of sameness. On the contrary, “The Last Jedi” feels like the freshest, most original chapter in the Star Wars saga in some time, building upon and expanding the mythology in very exciting ways. It’s a fearless, risk-taking experience that will leave fans in awe. Writer/director Rian Johnson (“Brick,” “Breaking Bad”) has picked up right at the moment where J.J. Abrams left off– with the menacing First Order hunting down the plucky band of Resistance freedom fighters operating under the leadership of General Leia Organa (the late Carrie Fisher, in one of her final performances), and with the Force-wielding Rey (Daisy Ridley) meeting with self-secluded Jedi Master Luke Skywalker (Mark Hamill) on the isolated island-specked planet of Ahch-To. Without spoiling anything more about the narrative itself, I’ll say that Johnson takes that ball and runs with it in some unexpected directions. “The Last Jedi” is far and away the boldest, most audacious Star Wars movie since “The Empire Strikes Back,” though it never hews too close to the structure of that second movie in the original trilogy. There are surprises around every corner here, and at least several things we’ve never seen before in this universe. The performances are stellar across the board, with Hamill trading in the stoic, restrained Luke of “Return of the Jedi” (not to mention the the gee-whiz farmboy Luke of “A New Hope”) for something far different entirely. We’re also thankfully treated to quite a bit more screen-time with Carrie Fisher, who skillfully trades barbs and commands with hotshot pilot Poe Dameron (Oscar Isaac) and dauntless newcomer Admiral Holdo (a game, purple-haired Laura Dern). The centerpieces of “The Last Jedi,” however, are Rey and the Son of Solo himself, Kylo Ren (the gripping Adam Driver). As implied in the film’s trailer, their mysterious connection continues to evolve as the war rages around them, both of them adrift in a sea of uncertainty and inner conflict. The success or failure of this current Star Wars trilogy increasingly rests on their shoulders, and in scenes between these characters and the enigmatic Snoke (Andy Serkis) they prove themselves capable of carrying the franchise into Episode IX and beyond. The tone is perhaps a shade darker than “The Force Awakens,” but there’s also plenty more in the way of comic relief, with a slight overabundance of jokes sprinkled throughout– many of which work, some of which regrettably don’t. I shook my head at one or two gags that wouldn’t have felt out of place in “Spaceballs.” It’s never quite enough to completely derail the proceedings, but the most egregious offenders could have easily been excised. While we’re exploring minor quibbles, there’s also a side-quest adventure that ultimately feels disposable– a product of wanting to give each and every character something to do, and of there being a handful of too many characters overall. Because of this, the larger picture occasionally comes across as divided into subplots of various levels of interest. But once the storylines converge, the movie follows suit and congeals into a compelling whole again, after getting partially sidetracked in the second act. Those negligible shortcomings having been addressed, there are far more positives than negatives in “The Last Jedi.” The ways the movie subverts expectations and deals with the various cliffhangers and lingering questions from “The Force Awakens” are especially clever. The visuals and direction are subperb– there’s literally never a dull moment on-screen, and it may be the first Star Wars movie I would attempt to watch with the sound off to see if it’s still just as entertaining. 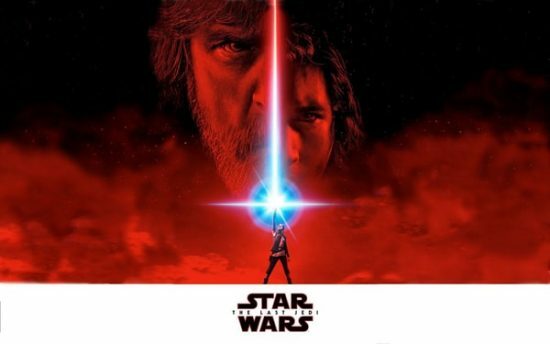 I think there’s an argument to be made that “The Last Jedi” sometimes feels like a collection of short films about Star Wars, presented in sequence, and consisting of stories with varying stakes and quality. For that reason it never quite functioned as a living, breathing whole to me. But the sequences that work (particularly the white-knuckle opening space battle and a couple climactic showdowns near the end) are somehow, amazingly, even more effective than a lot of what has come before in this beloved forty-year-old franchise. Five years ago after a screening of his sci-fi action film “Looper,” I said to myself, “Rian Johnson should make a Star Wars movie.” And though it’s not absolutely flawless, “The Last Jedi” still emphatically proves that I was right. This entry in the cherished ongoing space saga will be talked about and analyzed for years to come, and it will set a high bar for whatever Star Wars stories Johnson dares to dream up next. “Star Wars: The Last Jedi” opens this Friday, December 15th in theaters nationwide.